Data Visualization is an inevitable aspect of business analytics. As more and more sources of data are getting discovered, business managers at all levels embrace data visualization softwares, that allow them to analyze trends visually and take quick decisions. Currently, the most popular tools for visualizations / data discovery are Qlikview and Tableau. We have already published a step by step learning path for Qlikview. Tableau is one of the fastest evolving Business Intelligence (BI) and data visualization tool. It is very fast to deploy, easy to learn and very intuitive to use for a customer. Here is a learning path to all those people who are new to Tableau. 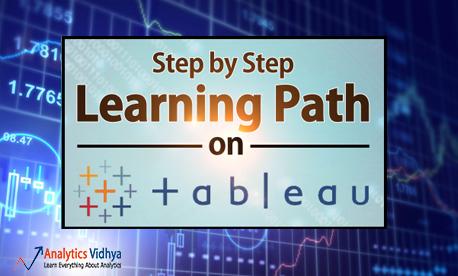 This path will help you to learn Tableau in a structured approach. Beginners are recommended to follow this path religiously. If you already have some background, or don’t need all the components, feel free to follow your own paths and let us know how did it turn out to be! Step-0: Why Data Visualization is Important? 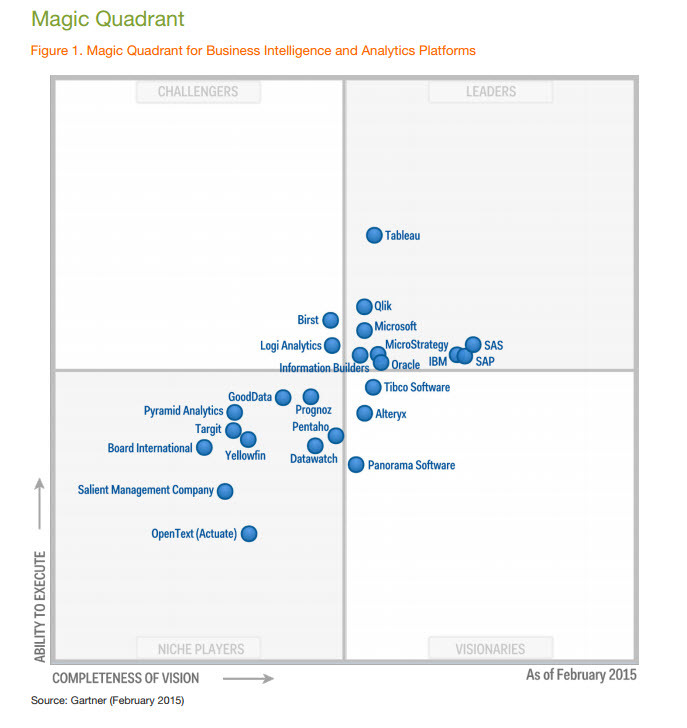 As per Gartner’s magic quadrant 2015, Tableau is a market leader across all the BI products. Tableau Reader: Let you read files saved in Tableau Desktop. Tableau Public: For journalists or anyone to publish interactive data online. Tableau Desktop comes in both a Professional and a lower cost Personal edition. Tableau Online is available with an annual subscription for a single user, and scales to support thousands of users. Tableau have gone through different versions, here we will discuss the learning curve of Tableau Desktop 9.0. You can download trial version of Tableau Desktop from Tableau website but it is available for 14 days only. Install it in on your machine by following steps and start for your data visualization journey. Tableau provides Free Online, Live and Classroom (paid) training programs. This is the best place to start your journey. I would recommend you to follow the path below. Here is Free Online training (“On demand”) with additional resources. All these videos contain the data set to explore at your end. To watch these training videos, first you need to register yourself. Expand the “Getting Started” section and watch available three videos. These videos will talk about connecting with data, data preparation, building views, filters, dashboards, story points and ways to distribute. Tableau can connect with various data sources such as text, excel file, databases to big data queries also. In this section, we will look at the basics and advance feature of data connectivity with different sources. Here we will also look at Join types, Data Blending, connection with cubes, custom sql and Google Analytics. This section has 12 videos and average length of videos are ~5 minutes. Tableau has multiple options to represent data in different views, applying filters /drill downs /formatting, creating sets, groups, generating trend lines and performing forecasting. Start exploring ! You have now looked at various objects to visualize data. One big dilemma that you will face while creating data visualization is which object should you choose to represent data. 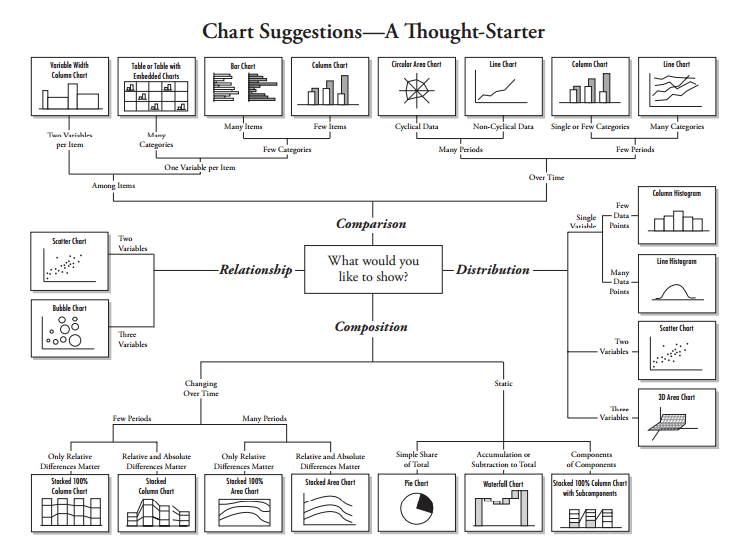 The snapshot below will help you to choose and decide the type of visualization. However, the feature of automatic selection of views available in tableau takes care of this issue largely. This feature automatically activates best views for selected dimension(s) and measure(s). Hence, you need no worry. You are in safe hands ! Kaggle has hosted a data science competition to predict category of crime in San Francisco based on 12 years (From 1934 to 1963) of crime reports from across all of San Francisco’s neighborhoods (time, location and other features are given). Please share your visualization on our social media channels and tag us, best visualizations will be rewarded exciting gift vouchers. Tableau Community: It works on a principle of Learn, Connect and Enjoy. It has forums, groups, ideas, Viz talk and workbook library. Here you can get your questions answered quickly. By using ‘ideas’ section, you can Vote on the Tableau Community’s best product ideas and add your own to the mix. Analytics Vidhya Discuss: We are niche in this domain but have tableau experts on board. These experts will answer your questions in detail and in simplistic approach. Our discussion portal already has few questions related to Tableau and a lot of other topics. You should jump in, if you have not already. Blogs: Blogs are always helpful to understand detailed content covering basic and advance concept of any complex topic in a more structured and simplistic way. Tableau Software: The biggest Tableau group on Facebook, with over ~75k likes. Tableau Software Fans & Friends and Tableau Enthusiasts : These two are biggest and active group on LinkedIn having 20 and 6 thousands members respectively. Besides the available measures and dimensions, you can create a calculated expression to develop a new visualization. It may be based on date, mathematical logic, text expressions, input parameters and others. For Data scientists, they can connect tableau with R to enhance the power for analytical inferences. You can refer How To section of “On Demand” tableau training to explore these visualization methods. Using Tableau server and Online, you can schedule the tasks and provide authorization to enable data security. It is a job of Tableau administrator but having understanding about these concepts always help you in dashboard development. Below are the resources to understand these two concepts more effectively. By now, I have almost covered most of the concepts you need to create a good dashboard / visualization. Now it’s time to practice more and more such that you get a firm hold of this tool and you feel comfortable with any aspect of Tableau. What do you think of the learning path? If you think something should be added / removed, do let us know. We will love to hear it. Tableau is the business intelligence software provides an easy way to use the applications for fast analytics and visualization. Thank you, this was vey helpful! tableau is the best source till date for data visualization and reporting and the features which it provides makes it one of best tool of the time. I am still working with the public version. Much more to learn . thanks for the tips of tableau. Thanks for the roadmap. It will be of great help.